Steve, over at White Sox Cards, has a game he plays every so often called "Sox or No Sox." In the game, he opens a pack of cards and gives the pack a score based on several criteria (which I have borrowed and modified for my own version). As some of you know, I have joined the ranks over at A-Pack-A-Day and recently posted an article containing three of the packs from a box I bought at Wal-Mart recently. Well, I decided that I would play "Tribe or No Tribe" with the whole 20-packs for 20-bucks box! (Borrowing from White Sox Cards) There are two traps to look out for. The first trap is the Reds card. Since this is an adaptation of the White Sox Cards game, I though it befitting that the "other" team from Ohio be the main trap card. The second trap is the Braves card. Why Braves? 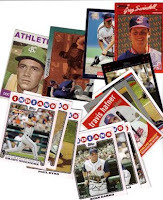 It is the "other" Native-American-based team, that is often confused with Tribe cards by young, new collectors (read: my daughter) Traps are not necessarily bad things, but they get in the way of the games true goal: to find Indians cards. 1/2 point is awarded for each card in the pack. 2 points are awarded for each relic or autographed card (only 1 point awarded for a relic or autographed trap card). 1 point is awarded for any Thome card in a non-Indians uniform. 2 points are given for each Indians card. 1 point is deducted from the score for each trap card. 1/2 point is deducted for each card featuring more than one team. Pack 1: Leon Durham (Cubs), Brent Mayne (Royals), Shawn Abner (Padres), Rich Garces (Twins), Rickey Henderson (Yankees). Pack total: 2.5 points. Pack 2: Britt Burns (White Sox), John Courtright (Reds), Jim Presley (Mariners), Chris Codiroli (A's), Fred McGriff (Padres). Pack total: 1 point - dang Reds card! Pack 11: Brook Jacoby (Indians), Mark Grace (Cubs), Charlie Hough (Rangers), Bill Doran (Astros), Teddy Higuera (Brewers). Pack total: 4 points! Pack 12: Danny Graves (Indians), Mark Thurmond (Orioles), Vince Coleman (Cardinals), Carmen Castillo (Indians), Milt Thompson (Cardinals), Keith Moreland (Cubs). Pack total: 6 points thank to TWO Tribers and an extra card in the pack! Wahoo! Pack 18: Stan Berry (Royals), Don Robinson (Pirates), Mark Langston (Expos), Gary Thurman (Royals), 1984 Topps AL Active Career RBI Leaders. Pack total: 1.5 points - curse you Topps Leaders cards! The score from the second half: 30.5 points! We can see that despite the run of mixed-team Leader cards, there were enough Tribers (and extra cards in several packs)in the mix to pull out quite a score from the 2nd set of re-packs. We can also se that things would have been much worse if this box has been opened up by Steve over at White Sox Cards! While there were a lot of White Sox in this box, there were quite a few Red Sox and Cubs in there as well! Choosing the All-Time Indians Uniform Number 8 proved to be a very difficult decision. Ray Fosse was a great defensive player, but also managed more than few batting feats during his career, as we've seen during the countdown. He was not a superstar, but to me, he was a great everyday everyman kinda player who exemplified what it meant to go out there and play ball for a living. So, I tip my hat to Mr. Fosse, who gets my pick for All-Time Triber #8! Baseball purists may balk at my decision since there is no doubt that STATISTICALLY Albert Belle kicks everyone's rear-end in the #8 spot. He is a personal "Fan Fave" of mine, too. But, the fact is that I decided when I set out to make this list that the All-Timers should not only be statistically worthy, but should also be sportsmanship-worthy. And, well, let's face it, Belle's list of anger-management issues is nearly as long as his Indians achievements. As for Keltner, I'm sorry to say that his lack of commitment to one particular uniform number played into the selection, fair or unfair as it may seem to some. Carmen Castillo was also one of my finalist picks, and in many respects sits above Keltner as far as Uniform Number 8 goes. Castillo was a great part-time player who put in his fair share of days with the Tribe, but it just wasn't quite enough for me to pick him over Fosse. Still, I think it's worth mentioning that he was in the top picks for the #8 spot. I can finally post a couple of trades that came my way recently (or not-quite-so, as the case may be)! This post was originally started on my birthday (April 20), but between the family get together and my recent outpatient venture in which I took Bob Barker's advice and projected it onto myself, I am now finally able to post this! Steve, over at White Sox Cards, sent me a stack of goodies after receiving a vintage Sox card and a few 'bonuses.' Some of the highlights of the cards he sent include: 1995 UD SP Albert Belle; 1995 UD SP Platinum Power Jim Thome; 2006 UD SP Legendary cuts Bob Lemon, Lou Boudreau, and Stan Coveleski; 2006 Fleer Flair Showcase Pronk; 2006 Bowman Heritage (BHP) Michael Aubrey; 2005 Donruss Champions Sean Casey; 2005 UD ESPN Pronk; 2007 Topps Co-Signers Pronk; 2007 Topps '52 Auto'd Aaron Laffey; 1968 Atlantic Play Ball Sam McDowell; 1976 Topps Jackie Brown; and a whole slew of other cards! SuterB, a regular contributor to the comments portion of my show here, answered a trivia question I had buried in one of my posts and he was award a prize (and I believe I sent a few extras with it, if memory serves). He returned the favor with a stack of Tribe cards which included a surprise card. He gave me several hints as to whom the player was, but I am too dense to have figured out. Luckily, he sent me the card anyway! :-) His offering included quite a few ALCS/ALDS Topps cards; a couple Pronkers; 2006 Topps Shoppach; 2007 Lofton Updates & Highlights; 1997 UD Great Futures Bartolo Colon; a few other cards and the player who would one day manage the Tribe? A 1964 Topps Doc Edwards (playing Catcher for the then Kansas City Athletics)! Great stuff! What do the Indians and White Sox have in common? The Indians scored 11 runs tonight! My son plays little league and is on the White Sox team this year. His team also scored 11 runs tonight. In fact, his first at-bat of the season resulted in a first-pitch over-the-fence home run! Awesome stuff for the 11/12-year old group! And then his 2nd at-bat resulted in an error at first which ultimately led to an inside-the-park home run for him! 2-for-2 with 2 runs - talk about a proud papa! Mickey Vernon - 2+ seasons (1949-part of '50, 1958) - He was born in 1918, making him 90 years old next Tuesday (April 22)! We first talked about Vernon in the Uniform Number 3 spot. In 1958, Vernon came back to the Tribe after playing with the Senators and the Red Sox. It was the only year he wore #8 for the Indians. He got earned a very respectable 104 hits on 355 at-bats with 49 runs. He also had 22 doubles, 3 triples, and 8 home runs with 55 total RBIs that season. His at-bats/RBI ratio was 6.5, which ain't too bad at all in my book. He left the Indians for the Braves in late 1959 with a .293 average on the season. Fred "Papa" Williams - Part of 1 season (1945) - Before there was "Big Papi," there was "Papa Williams." Papa did not enjoy the same success that Papi has. Williams batted in 16 games his whole MLB career. He got 4 hits on 19 at-bats, was walked once, and struck out twice. He left the majors with a .211 average. Unfortunately, I could not find out much about Papa Williams. Pete Whisenant - Part of 1 season (1960) - As is the continuing trend with good ol' #8, Pete did not stay in a Tribe uniform very long - only 7 games. He managed to get 1 hit on 6 at-bats while striking out twice. The Indians sent him to the Senators with a .167 batting average. Ray Boone - 5+ seasons (1948-Part of 1953) - Boone wore #28 and #11 his first year in the majors, then switched to #8 and stayed there for many years, even after leaving the Tribe. Boone played for the '48 World Series Tribe team, getting 1 at-bat and promptly striking out. Luckily, this would not prove to be the end of his career. Over his Indians career, he had exactly 1,600 at-bats. I don't know why, but I always think it's cool when a player has a round number like that for any of his stats. He had 414 career hits with 235 runs and 202 RBIs. He hit 34 home runs, 42 doubles, 15 triples and was walked 219 times. He also struck out 135 times. He was traded to the Tigers in '53, leaving Cleveland with a .283 average! 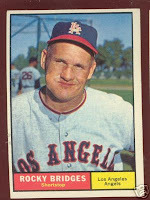 If the name sounds familiar, it's because his son Bob and his grandsons Bret and Aaron all played in the majors, too. In fact, the Boone's are the first family to send three generations of players to the All-Star Game. Now, how cool is THAT!? Not to mention that, according to several sites, are directly related to Daniel Boone. 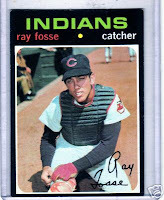 Ray Fosse - 7+ seasons (1967-1972, 1976-Part of '77) - Fosse has the distinction of being the first Indian ever picked up by the draft pick system. He is also the catcher being run over by Pete Rose in the 1970 All-Star Game footage you have probably seen over and over again. He grabbed the Golden Glove Award in 1970 and in 1971. Did I mention a 5-RBI game (a grand slam and an RBI single) in 1970? How about TWO 2-home run games (1970, 1972)? Also in 1970, he managed to sneak in a 23-game hitting streak. Oh, and he also caught for Eckersley's no-hitter in 1977. Not a bad run as a Triber, I'd say. Oh, wait, should we talk about stats? How about 600 career games as an Indian (love the round numbers) with 2039 at-bats, snagging 549 hits and 219 runs. Man, one unit away from the 'rounders'! LOL... He scored 219 runs with 230 RBIs while hitting 77 doubles, only 5 triples, and smacking 50 home runs. He was hit by the ball 12 times and walked 155 times, while striking out 243 times. This guy came to play some ball. He had two .300+ seasons which were over shadowed by a .063 rookie season and a one-game no at-bats 2nd season followed by a .172 average in his third season. Take those out, and he had 5 .240+ seasons altogether (that's including the two .300+). Though officially he has a .203 average, I removed the one-game no-bat season and he walked away with an overall .232 average during his years in an Indians uniform. Rocky Bridges - Part of 1 season (1960) - With a name like that, how could you NOT have a sense of humor? And, Bridges was widely known for his quips. I think this one sums up how I would feel if anyone ever asked me to don a Tribe uniform: (On being asked by Chuck Dressen if he was willing to play third base to prolong his career) "Hell, yes. I'll mow your lawn if you like—I want to stay up here." He only played in 10 games for the Indians, getting 9 hits on 27 at-bats. 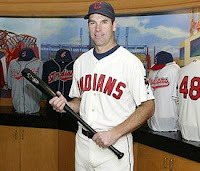 His .333 Indians career includes 3 RBIs. 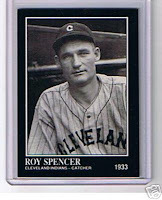 Roy Spencer - 1+ seasons (1933-Part of '34) - No, not the Rocket Scientist, this Roy Spencer played in 75 games his first year with the Tribe and only 5 games his second year. He had 47 hits (25 RBIs) on 234 at-bats with 6 doubles, 2 triples, and 18 strike outs. His years with the Tribe proved to be his career lowest two years. He left the Indians for the Giants with a measly .173 batting average. Rudy Regalado - 3 seasons (1954-'56) - In his rookie year, he helped the Indians get to the 1954 World Series, during which he went 1-for-3 in the Series. He played in more than twice as many games in his rookie year than he did in the following two years combined. Overall, he played in 91 games during his MLB career, all with the Indians. In 253 at-bats, Regalado had 27 runs (31 RBIs) on 63 hits with 8 doubles and 2 homers. He left baseball with a career .249 batting average. Von Hayes - 2 seasons (1981-82) - I always thought he had a cool baseball name, and often wondered if "Vaughn" in the "Major League" movies was named after this guy. I digress. Hayes did well for himself during his stint in a Tribe uniform, earning an Indians career .253 batting average. He pulled that together by getting 160 hits in 636 at-bats, scoring 86 runs, 99 RBIs, 33 doubles, 5 triples, and 15 homers. He only had 73 strike outs and was walked 56 times. Chris Berman (ESPN) would come to refer to him as Von "Purple" Hayes in reference to Jimi Hendrix's "Purple Haze." Willie Kirkland - 3 seasons (1961-'63) - Kirkland wore Number 8 in '61 and '62, then switched to #27 in '63. He served as a utility outfielder throughout his career. He batted in 410 games wearing the Indians uniform and got 318 hits in 1,371 at-bats. Each of his Tribe seasons ended at .200+ average, and two of his seasons ended at .230+. He accomplished this with the help of 191 runs, 44 doubles, 8 triples, and 63 home runs, bringing in 214 RBIs. Overall, he batted .230 wearing Chief Wahoo. Just when I get creative and pull the wheels off the 2-0 wagon (such that the Tribe goes 2-3), they win another one. LOL! Like I said, I'm glad we have a ways to go! Something about friends jumping off a bridge? Step Three: Copy and paste "Never Gonna Give You Up - Rick Astley" into the field. Step Four: Enter some semi-plausible information in the required fields. Congratulations! You have Rick Rolled the New York Mets! Do it quickly, you only have until Monday at noon! Not long ago, I sent a 1959 Topps Hank Aaron card (plus some other Braves cards) to DAYF (http://cardjunk.blogspot.com/). After he got it, he sent me a message that contained the mysterious "warning:" "I hope you like Pronk!" I am a big Pronk (Travis Hafner) fan! So, today in the mail, I had a padded envelope waiting for me. I ripped it open to find I had been Pronk'd! Plus, there was a whole lot more in there, too! Thanks a TON, dayf! These are great. It's amazing how trading cards has become so much fun again with all these different swaps going on! In unrelated news, the Pittsburgh Penguins beat the Flyers and secured the Atlantic Division title! 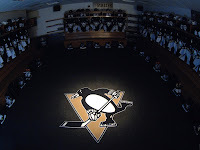 I watched the game live on NHL network. Awesome stuff!! "You just have to be heavy enough..."
Victor Martinez pulled a hammy while running to second, so he's out on "day-to-day." Ouch!! And, how about Thome? Two homers in an Opening Day game!? Yeah, I know, he's on the wrong side of the bat, but that is way cool! And, his first homer was the first time C.C. gave up a home run to Thome. That says a alot about C.C. for sure! Casey Blake got up to bat in the 8th and swung for the fences. "I was begging for a home run there," Blake said with a smile. (source: Indians.com) Begging is right. Instead, the ball went off the top of the wall for a lead-taking, bases-clearing hit. The Tribe won their home-opener 10-8, and both teams played great! Now, THIS is baseball! Oh, and it turns out the Pirates won their first game, too! Having grown up in Pittsburgh, I am always a Pirates fan. Of course, since they won already, there's a good chance that will be the last win for quite a while... Bummer. Maybe they'll prove me wrong! And, how can I talk about Opening Day without mentioning the "Old School" / "Throwback" uniforms? Seriously, who decides these things? Throwback cars with updated features, yes. Throwback baseball cards, okay but getting old and repetitive. Throwback uniforms, jury is still out for me. The Tribe unis aren't too bad, compared some of the other 'old school' uniforms the teams are busting out lately. The main thing that using 'throwbacks' says to me is that the creative designer behind the uniforms is out of ideas. The same holds true for baseball cards and automobiles. Look, I love the new Challenger as much as the next HP-hungry guy, but the truth is, the designers too the Charger, chopped it up, and threw on a 70's-style body. It was not much of a leap. Same holds true for the uniforms... Oh well, eventually the "need" for bringing back the old days will pass, and we'll see some cool designs again.